STS 5th and 6th grade students along with their teachers and parents will host this years Senior Service Luncheon - grandparents, friends and neighbors are invited! 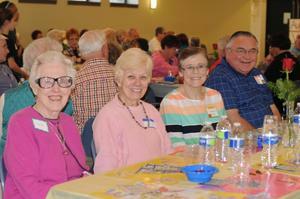 The STS students and staff are excited to again host this years Senior Citizen Luncheon. Mayor Schwantz will be calling out the first round of BINGO! Plenty of food will be made by parents and also donated by local merchants including Simply Delicious Catering. Our spring theme senior event gives our students an opportunity to deliver kindness to seniors in the community! Please invite grandparents, neighbors and friends! Great raffle prizes and personalized place mats made by the students will be available for all our guests! See you there!